Petron Energy II, Inc. is engaged primarily in the acquisition, development, production, exploration for and the sale of oil, gas and gas liquids in the United States. As of December 31, 2012 the Company is operating in the states of Texas and Oklahoma. The Company sells its oil and gas products primarily to a domestic pipeline and to another oil company. Petron Energy II Pipeline, Inc. is engaged primarily in the transmission of gas and gas liquids for its own wells and third party wells in the United States. As of December 31, 2012 the Company is operating in the state of Oklahoma. In addition, the Company owns two gas gathering systems located in Tulsa, Wagoner, Rogers and Mayes counties of Oklahoma, one of which is fully operational. The pipeline consists of approximately 132 miles of steel and poly pipe, a gas processing plant and other ancillary equipment. Petron Energy II Well Service, Inc. is engaged primarily in Well Service operation for its own wells currently and expects to begin well service operations for third party operators in the future. As of December 31, 2012 the Company is operating in the states of Oklahoma and Texas. The Company owns all of its equipment used in the Petron Energy II Well Service, Inc. The company recently agreed to acquire approximately 2800 acres in Munday (Knox County) Texas, this property is comprised of 48 wells. The property has 34 of 48 existing wells capable of producing commercial quantities of oil. We are reviewing the property for further producing zones which may be available. 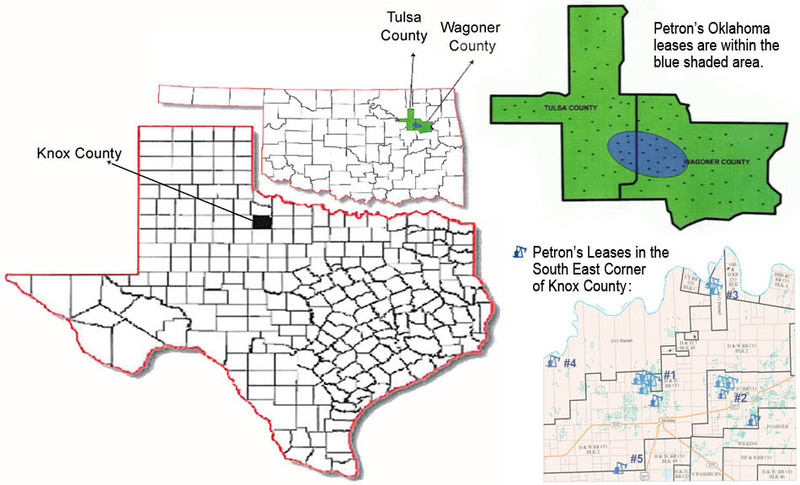 Petron purchased a 75% stake in approximately 1100 acres with 59 wells in Wagoner and Tulsa Counties, Oklahoma. We have 56 existing wells and 3 newly drilled wells. This acreage has 5 to 7 payzones, which are capable of producing oil, gas and or both commodities. The company has purchased 75% equity stake in a 105 mile pipeline gas system, Petron Energy II Pipeline, Inc. The pipeline system extends from Wagoner County into Tulsa County Oklahoma. This system is critical to our development in the area because it provides us access to deliver our gas to market at minimal cost. We believe our ownership of the gas pipeline system will provide us opportunities to grow our acreage as we are the only transporter of natural gas in the area. The company has also purchased a 75% stake in a second gas pipeline system, Petron Energy II TNT, Inc. This pipeline system extends 30 miles through Wagoner, Mayes, Rogers and Tulsa Counties Oklahoma. There were over 450+ wells drilled and tested in anticipation of the completion of this gas system. This system provides access to a natural gas market for us along with development opportunities for the company. Petron Energy II TNT pipeline is the only gathering system to transport natural gas the area.